Events, Tickets, Jams and Open Mics in Ithaca, Star sightings at IGW, Policies, What's my stuff worth? Guitar Instructors, A Short History, Glossary and Links. All tickets must be purchased in person with cash or in some cases personal check made out to the promoters. Call us at 1-607-272-2602 for more information. 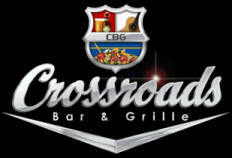 Thursday nights, Open Mic, Crossroads, 6:00PM - 9:00PM, Mike Thuesen host, 3120 N. Triphammer Rd, Lansing, NY 14882 call (607) 533-7539, for more information:http://www.thecrossroadsbarandgrille.com/ . Please let us know if you are holding an open mic or jam session or you know of any others in the area. 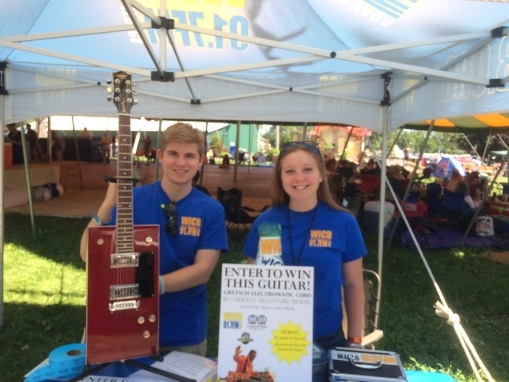 WICB DJs Chris and Riley on the weekend of July 16-19 at the 2015 Finger Lakes Grass Roots Festival displaying the Gretsch Bo Diddley model guitar that we donated for a Loaves and Fishes raffle. $456 was raised and given to the local charity which provides a place for free meals, hospitality, companionship, and advocacy for those in need, regardless of their faith, beliefs, or circumstances. Lake Street Dive's guitarist and trumpeter Mike "McDuck" Olson and drummer Mike Calabrese visited Saturday afternoon, 7/19/14 after their Friday night performance at the Finger Lakes Grassroots Festival. Great show, great players and great folks. Hope to see them back real soon. 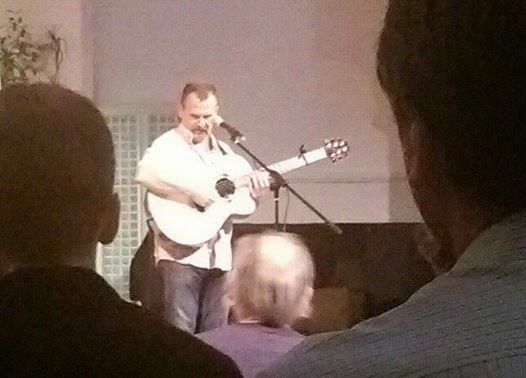 Martin Simpson visits before his show Saturday night, June 28, 2014. So nice of our old friend to stop by on his busy schedule. Wonderful and well attended show. We hope he doesn't wait another six years to come back and play for us! 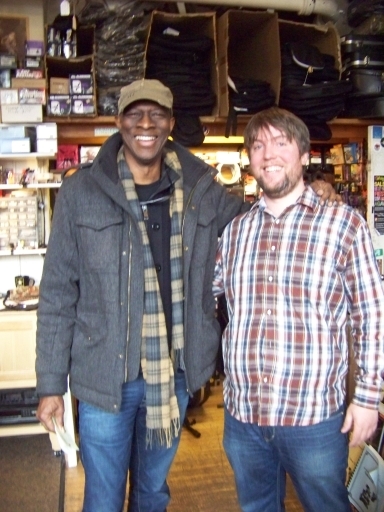 Friday, March 28th, 2014 we were honored with a visit from Keb' Mo'. What a gentleman. Tried a bunch of our more affordable semi-hollow electrics and purchased one of the new Gretsch Center Block guitars with the cool cat's eye sound holes. Looking forward to a great performance at the historic Ithaca State Theater tonight. Saturday May 18th, 2013 and a visit from David Boreanaz and son Jaden in Ithaca for Dad's Commencement speech at his alma matter Ithaca College. We're huge fans of Bones. Thanks for letting us photograph you with the 1969 Gold Top Les Paul Deluxe. Your always welcome. Multi-instrumentalist Nick Forster of the amazing bluegrass band Hot Rize and host of the successful radio show E-Town visited May 17th, 2013 just before their State Theater show. He's enjoying the tone of our Symphony Deluxe arch top. Thanks for stopping by Nick. Billy Bragg visits April 26, 2013. Really a gentleman. Thank you for visiting and I'm sure tonight's show will be awesome! 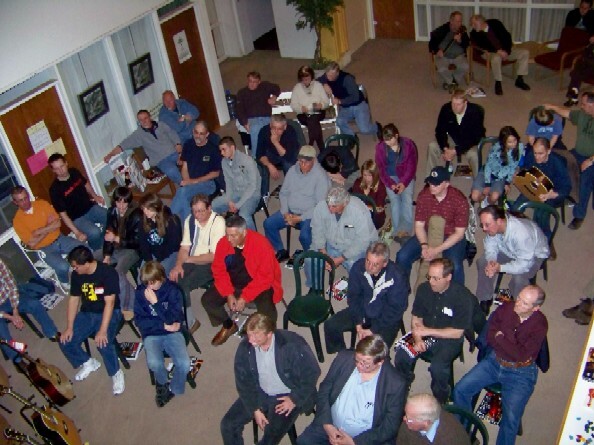 Thanks to everyone who attended the Taylor Roadshow Wednesday night (4/28/10) and especially Monte and Wayne. A good time was had by all. Demonstrations of standard and unique models, the affects of different tone woods and body types and sizes on sound, the capabilities of Taylor's sophisticated electronics systems and much, much more were exhibited to our largest audience ever. January 30, 2010 moe. visits the Guitar Works: On the way to The Historic State Theater for their Saturday night performance Rob Derhak and Al Schnier of moe. stopped by to look over the selection. 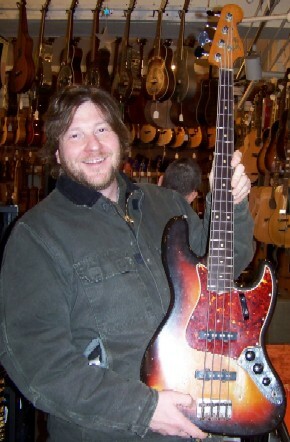 Rob found himself a nice old Fender bass and just had to add it to the collection. Thanks Rob and we'll keep looking for that elusive '50s Gibson Les Paul Jr. for you Al. 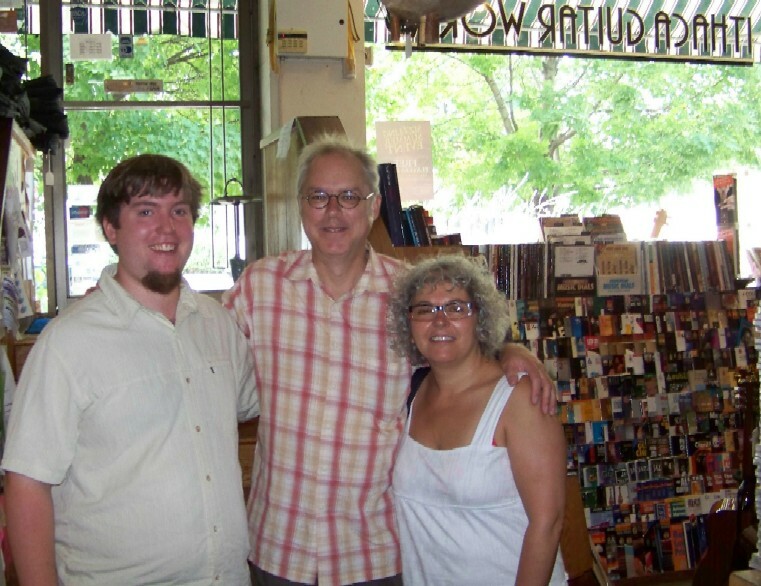 Tuesday, August 18, 2009 Bill Frisell visited us during his visit with his friend and band mate Hank Roberts here in Ithaca. He needed an amp for upcoming dates in NYC and where else would one go shopping for an amp in Ithaca but The Ithaca Guitar Works? Ash showed Bill two small tube amps and he fell in love with one and took it home. Pictures below, left to right are Bill and his lovely wife Carole with Ash Broadwell and Charles d'Orban with Bill. Thanks Bill and we hope the gigs go well. Thursday September 11, 2008 (Yeah! That's right - 911!) 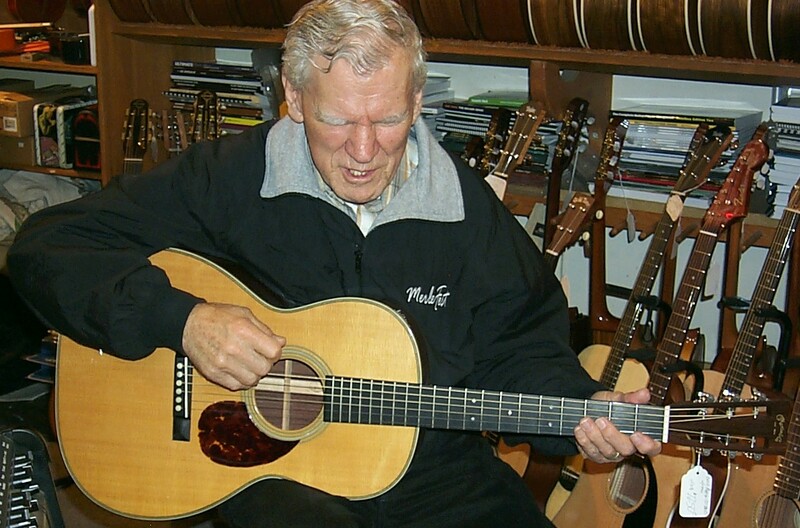 one of America's greatest living songwriters stopped into The Ithaca Guitar Works for a visit. 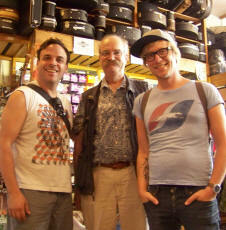 Our New York City friend Matt Umanov suggested he visit some of the music stores in Ithaca and, well, he found us. Steve confessed to being a "guitar degenerate." He then proceeded to charm us with his take on guitars, collecting, fell in love with one particular 12 string and suggested that he could play the banjo just good enough to scare sheep. We told him we were all looking forward to seeing him at his performance at Ithaca's Historic State Theater later that night. Ultimately he had to add that old guitar to his own collection. Thank you Steve and you're always welcome back here! BTW the show was great and opened with an inspiring set by Alison Moorer. 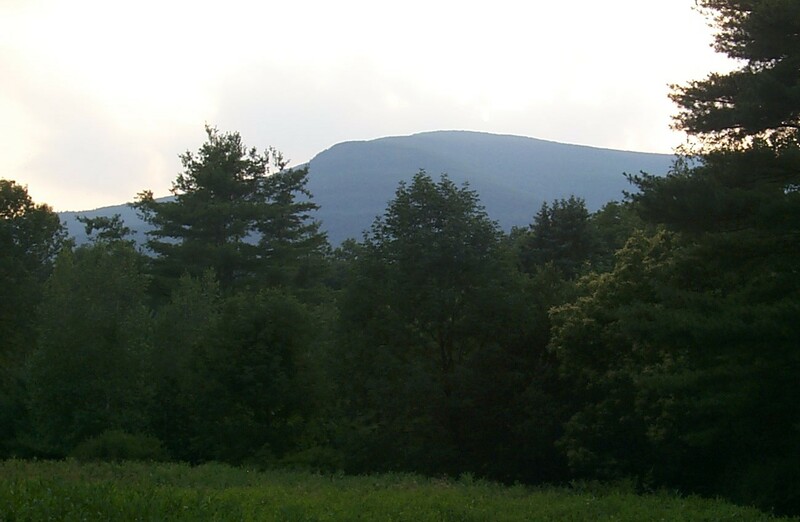 Overlook Mountain as seen from the front yard. 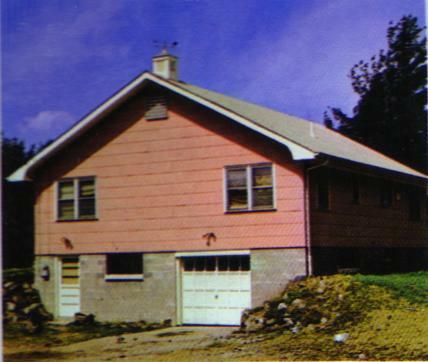 Big Pink as it looked in 1968. 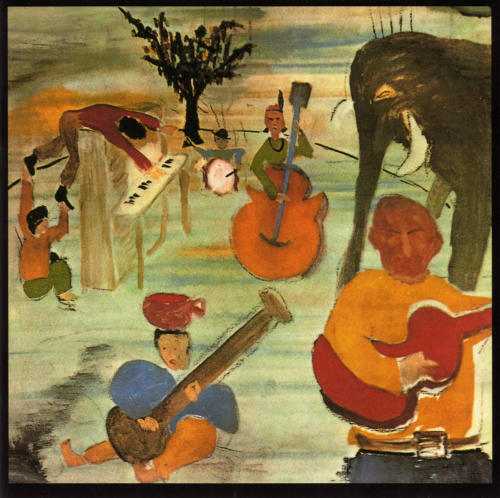 The classic album cover art by Bob Dylan. 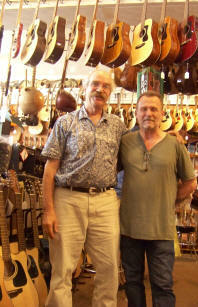 Doc visits the Guitar Works! 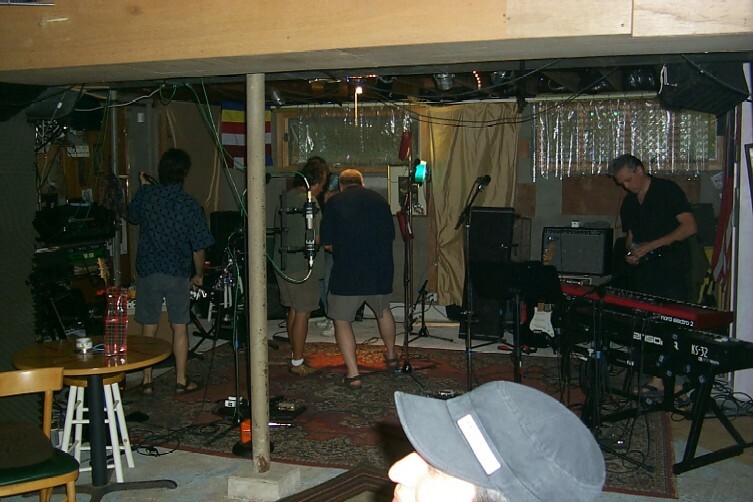 Imagine how excited and thrilled we were when Mr. Watson accompanied by David Holt stopped in for a visit and an impromptu rehearsal for their May 20, 2006 concert at the Ithaca State Theater. They graced us with versions of Nine Pound Hammer, John Henry, Trouble In Mind and Deep River Blues. 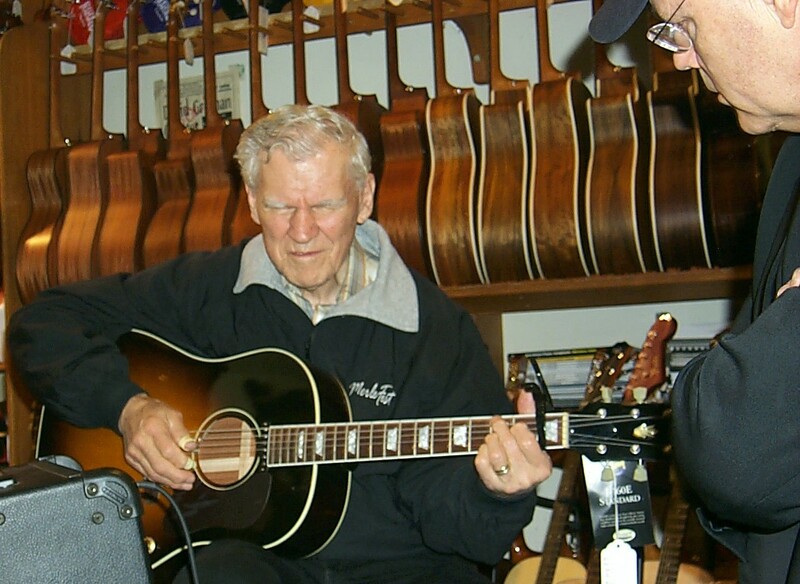 Pictures of Doc Watson and David Holt at the Ithaca Guitar Works! Wow! 83 years young and the Doc is still playing and singing as good as ever. Keep up the good work Doc. All sales are final. Store credit or refunds may be given at the discretion of The Ithaca Guitar Works only under the following circumstances: If for any reason you are unhappy with your purchase you may return it to us at your own expense within 48 hours. You must call us to schedule the return within 48 hours of receiving the instrument. It should be shipped by UPS Ground service, preferably in the same packaging in which it was received (unless the original packaging has been damaged and is no longer secure) and insured for the appropriate amount. Once we have received the instrument and made sure that it is still in the same condition as when we shipped it out, we will issue a store credit or refund (less any shipping costs). After 48 hours refer to "The $50 Deductible Trade-In" below. Absolutely no returns on electronic gear (amps, effects, etc.). Ninety days of free adjustments (starting from the date of purchase for guitars purchased from Ithaca Guitar Works only): For the next three months we will be happy to make adjustments to your new musical instrument. Free. These adjustments might include alignment of the neck and changes to the frets, bridge and nut. They do not include custom modifications or normal wear and tear like string breaking. From beginner to professional everyone has their own style and consequently their own requirements in the set up of a musical instrument. We want yours to play easily and sound great. The way you like it. String instruments need occasional service as do most things we use. Just as your car or home needs service now and then it is not uncommon for a guitar to sometime require the attention of a skilled luthier. 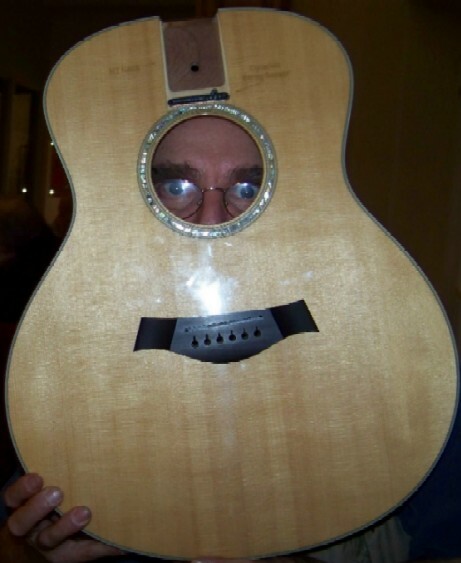 That�s why we carefully inspect and adjust every new or used instrument before we sell it. Then we offer you free adjustments to tailor your instrument to your style. It is our sincere hope that you will have many enjoyable years playing your new guitar and spend very little time getting it fixed. Your three months free adjustment period will usually span one major seasonal change and allow us to make sure your new instrument remains stable throughout its long life with you. We recommend at the very least you visit us for a free check up toward the end of this period so that we can spot any changes and remedy them within the first ninety days. Plan to visit us around mm/dd/yyyy_ even if everything seems fine. �If it ain�t broke don�t fix it" goes the old saying. But we invite you to call upon us any time and take advantage of this free checkup. Two Year Minimum Guarantee: We stand behind manufacturers� warranties with authorized service for most of the new guitars we sell. Some of these have lifetime guarantees, others as little as one year. Your new or used guitar from Ithaca Guitar Works has a minimum two year warranty no matter who made it. This covers the craftsmanship and materials on your purchase and does not cover strings and other normal wear and tear issues, abuse, neglect or alterations not performed by Ithaca Guitar Works. After a determination that any repairs fall within this definition, warranty service will be performed at no charge at our discretion. Neglect and abuse would include but are not limited to instruments allowed to overheat, freeze, dry out or become wet. The climate of our region necessitates the humidification of fine wooden instruments through the winter months. Yes, your new guitar can be ruined if left to dry out. Pick up a humidifier. The $50 deductible trade-in: (the following applies to used or second hand instrument only purchases from The Ithaca Guitar Works): You may wish in the future to trade up to a nicer instrument. If your last instrument purchase from The Ithaca Guitar Works was already used when you bought it and has not been damaged by abuse or neglect and has not been modified or altered from the original condition we will allow you a trade-in value equal to the original purchase price (before taxes or other charges) minus $50 toward a more expensive instrument. In this way we hope to accomplish two things: 1) guarantee that your original investment was a sound one and 2) allow you a great trade-in. ($50 can be much less than the cost of setting up that instrument for the next owner) The only requirements for this are: 1) That it was already a second hand stringed instrument when it was purchased from us. 2) That the instrument be in the same condition as when you purchased it from us and 3) that you accompany your trade-in with your original receipt or the date when it was purchased so that we can verify that trade-in allowance. As our instruments are all great values we are always happy to see them back. Layaway for 30 days: With the deposit of a non-refundable 25% of the total purchase price of an instrument we will hold that instrument on layaway here for 1 month from the date of deposit. With the payment of the balance within 30 days the instrument may be picked up. Otherwise it will be returned to stock and no refund of the deposit will be made. What�s my stuff worth? This is a question we hear everyday at The Ithaca Guitar Works. We are happy to provide verbal appraisals and advice on your instruments value at no charge but only if we can see and evaluate the instrument. So by all means bring it in. We love to look at and talk about stringed instruments. On the contrary it is impossible to quote even a "ball park" estimate of value without having the instrument in hand. Please call ahead to make sure someone qualified to appraise your gear will be present when it is convenient for you to bring it in. We can also provide a written appraisal on our letterhead at the rate of $30 a page. This charge may allow you to have several instruments appraised at the same time, on one page for one rate. Of course you must bring your instruments in for this service, though I have been known to make house calls on occasion when large numbers of instruments are involved. The internet is an excellent source for information (and misinformation). Here's a site I recommend that may at least provide you with a clue as to what your guitar might fetch were it in a store: www.gbase.com. This is a database of over 300 music stores, world wide and has an easy search engine that allows you to fill in your make, model and a variety of other information to see if there are instruments similar to yours being sold second hand in music stores. The prices may vary substantially but not as widely as they might at an on-line auction for example. We consult this web site as well as others quite often because it is about as up-to-date as you could hope for. Unlike "blue books" which are pretty much out of date by the time they go to print. We also take trade-ins, provide consignment services and buy gear outright. Again, we must see and test each piece before making an offer. If you call we can, in some cases at least, let you know if what you have is of interest to us. A bit of advice for those wishing to get rid of their instrument: you have many options from which to choose, with diminishing returns in each case as I've listed them here. You may choose to keep your instrument, which is always wisest. Or you might loan or give it to a friend or relative for them to enjoy. Or you could donate it to a school or charity (I'm thinking: tax deduction). To get the highest value for your gear you should definitely sell it on your own to someone who will play it. This can be done through any number of avenues (newspaper ad, craigslist, ebay, flyers around town, garage sale, etc.). You also might choose to trade it in for something different in which case you should expect to get something approaching its value less any service it may need. If you choose to consign your instrument, expect to get around 75% of the determined selling price (more or less depending on the store's policy), after any service it may need. Though it is the fastest, the least desirable choice for anyone wanting to part with an instrument is to sell it to a music store. Any music store. As a business, stores must cover their investments as well as any set up or restoration a guitar might need and then ultimately turn a profit when it is sold. Having said this, we are always interested in looking at nice used instruments for trade-in, consignment or purchase and we feel that a well informed customer can make a better decision about the disposition of his or her instrument after speaking with us. For more instructors in the Ithaca area call us at 607-272-2602. Way back in 1969 The Guitar Workshop, as it was called then, was opened by the late John Ellis. 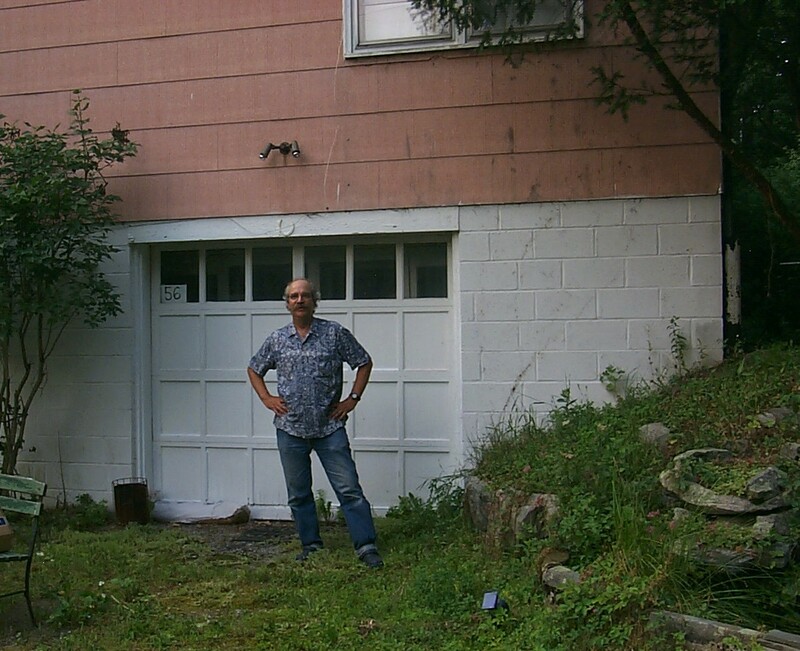 It was in the basement of a building on Eddy Street in the College Town neighborhood of East Hill near Cornell University here in Ithaca, New York. 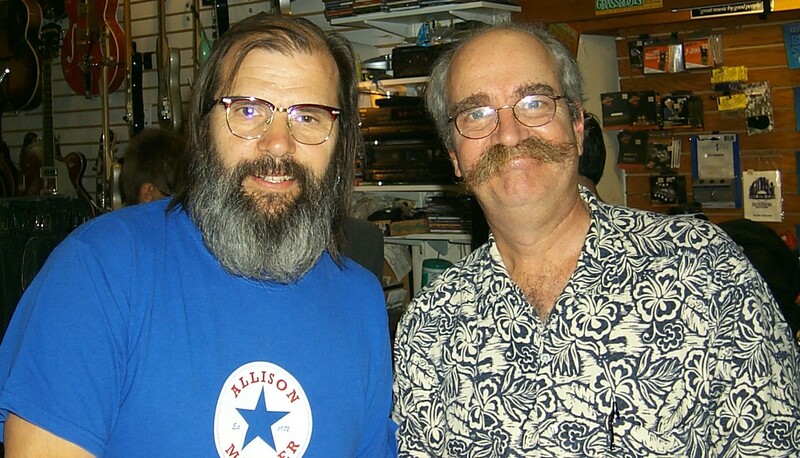 Many of our customers still remember that shop fondly and the incomparable Mr. Ellis. Meanwhile in 1971 architect William Downing bought and converted the old Ithaca High School into shops, restaurants, small businesses, offices and apartments. This four story brick castle like structure, built in 1915, is located at the corner of Seneca and Cayuga Streets in downtown Ithaca. In 1973 Mr. Ellis moved his store to the old school which is now known as The Historic DeWitt Mall. 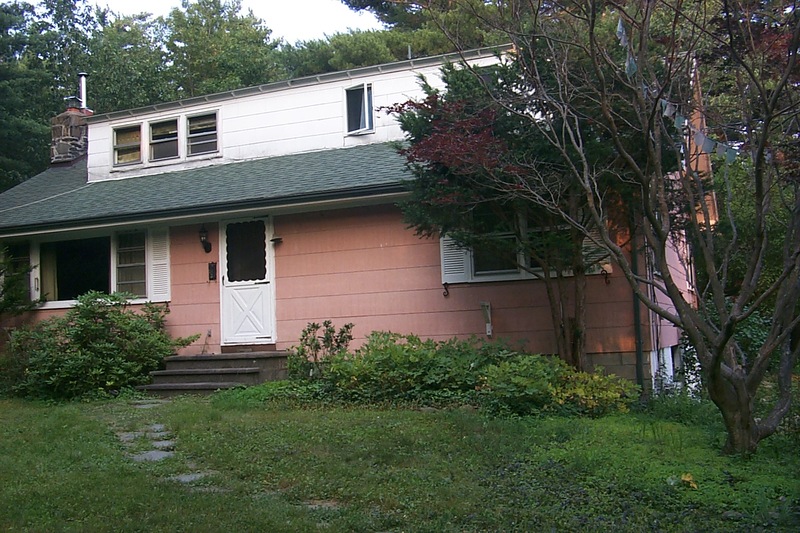 In May of 1978 John sold the business to Paul and Annie Meisensahl and Mark and Sandy Zwerger and it's name changed from The Guitar Workshop to The Ithaca Guitar Works. 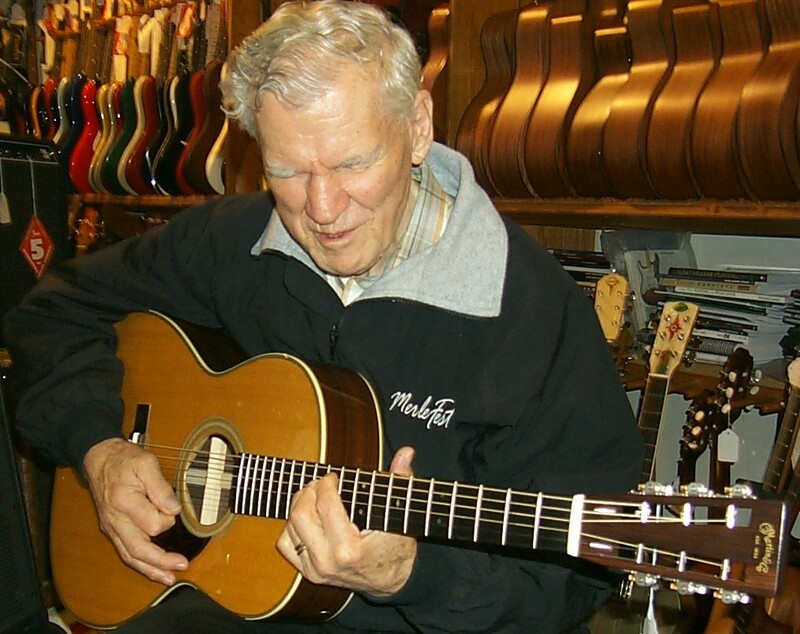 Maintaining the tradition of excellence established by Mr. Ellis in the late '60s the Meisensahls and Zwergers continued to represent such prestigious lines of instruments as Martin and Fender and build the occasional instrument. Shortly after, Eric Aceto came to work for the new owners where he honed his already impressive skills as a luthier. In 1981 The Ithaca Guitar Works was sold to Eric Aceto and Chris Broadwell. 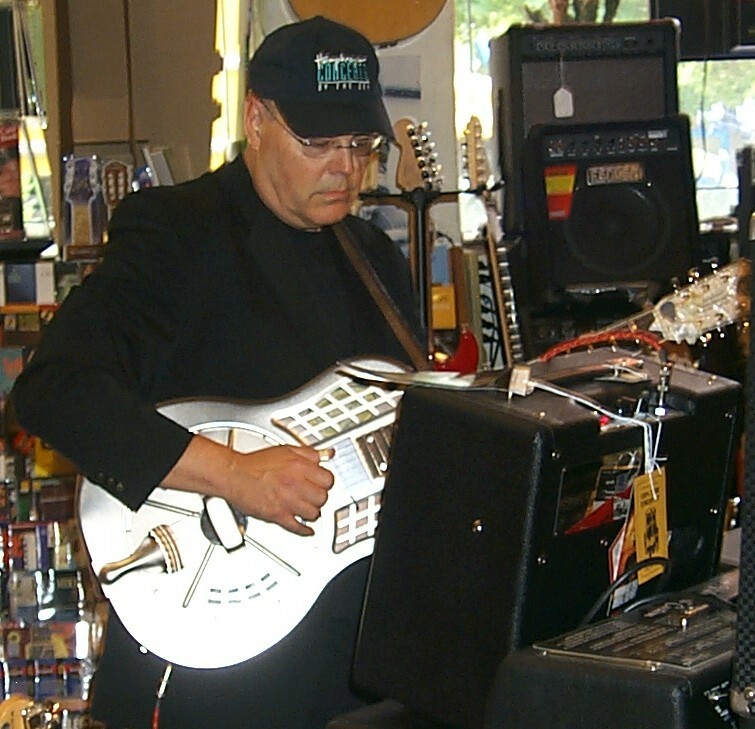 With great help from Harry Aceto, Heather MacLeod, Kate Rehner, many friends and family members as well as the former owners, The Ithaca Guitar Works continued its steady growth toward the multi-faceted, friendly, widely visited, down home, family music store it is today. 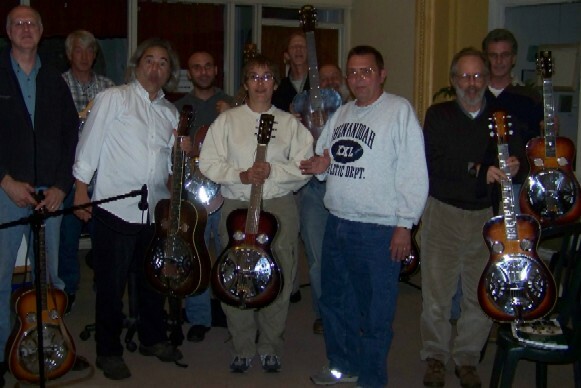 In 1989 instrument builder Dan Hoffman joined the team at the "Guitar Works" and in a short time a separate instrument building and repair facility was established in Trumansburg, NY. 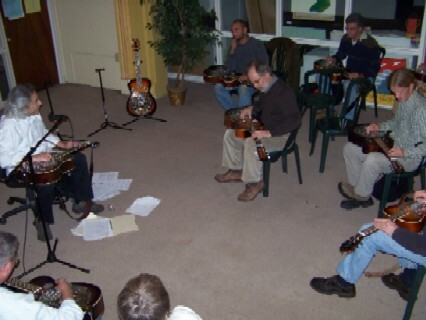 This is where collaboration began on the Oneida guitar and Mandolect as well as many unique custom instruments. The popular Aceto Violect violin and other acoustic and acoustic/electric instruments of Aceto/Hoffman design are crafted there today. 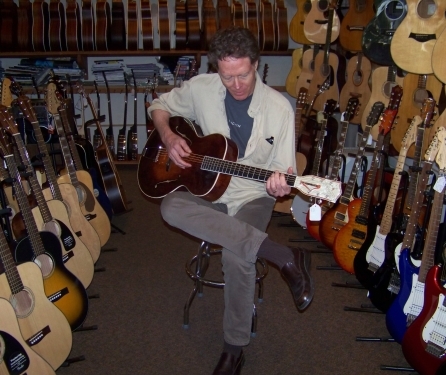 In 1995 The Ithaca Guitar Works expanded to double their space in the Dewitt Building by including the rooms on the first floor directly above the store which is located on the ground floor. The on site repair shop, office and storage area were moved upstairs and lesson rooms were added. 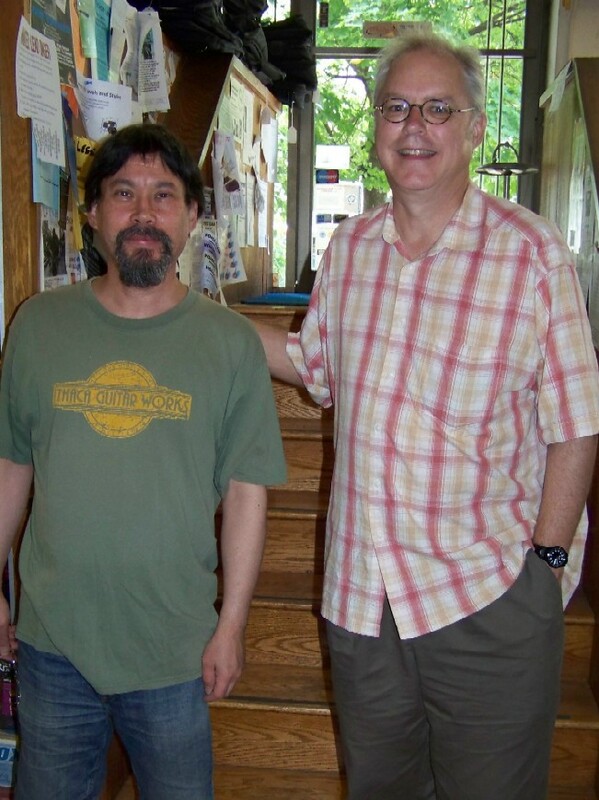 In 1996 wishing to spend more time performing and building instruments, Eric Aceto and Dan Hoffman left to dedicate their attention to what is now Ithaca Stringed Instruments at the Trumansburg location. 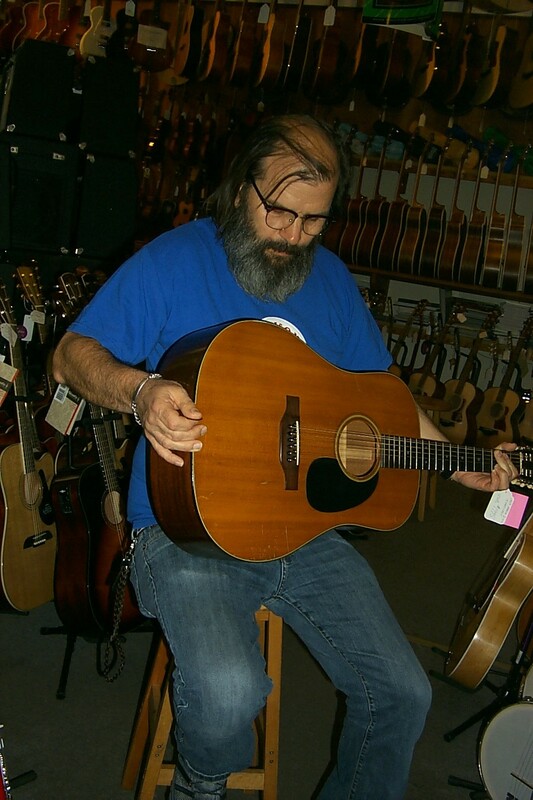 Chris Broadwell took over the reins as sole proprietor in July of '96 and is now in his 38th year at The Ithaca Guitar Works. With continued help from Harry Aceto restoring, repairing and adjusting stringed instruments, Heather MacLeod in the office and Chris' sons Ash Broadwell , and Ry Broadwell working in sales, repairs and everything in between the Ithaca Guitar Works continues in the tradition that now spans six decades. They offer lessons with the best instructor/musicians in the area. Factory authorized repair, adjustments, custom modifications and restoration of stringed instruments continue to be legendary. Instrument lines have expanded to include not just Fender and Martin but also Taylor, Guild, Deering, Gretsch, National, Gold Tone, Vega, Kala, RainSong and many many others with close to 1000 new, used and vintage instruments and amps from which to choose. The website, www.guitarworks.com, was created in 1996. Watch this site, the local papers and listen to WVBR-93.5 FM and WICB-91.7 FM for events, daily updates or call us toll free 607-272-2602 anytime during operating hours for availability, price quotes or just to yack about guitars. After all It is our middle name! 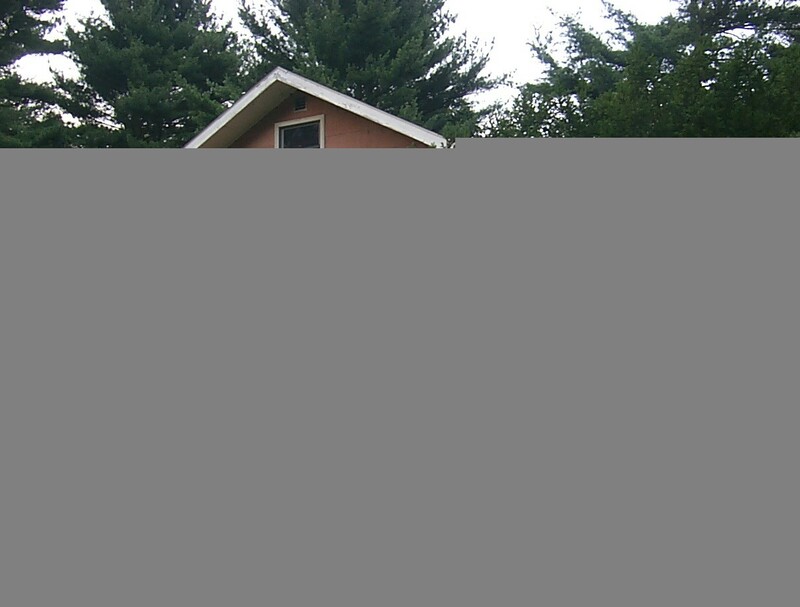 Things to do in and around Ithaca and the beautiful Finger Lakes region. Nate Clark: http://fingerlakesguitarrepair.com/. Independent luthier, fretted instrument repair. 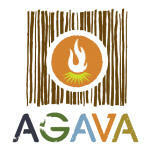 Down Town Ithaca: www.downtownithaca.com Events and opportunities in the Ithaca, NY area. 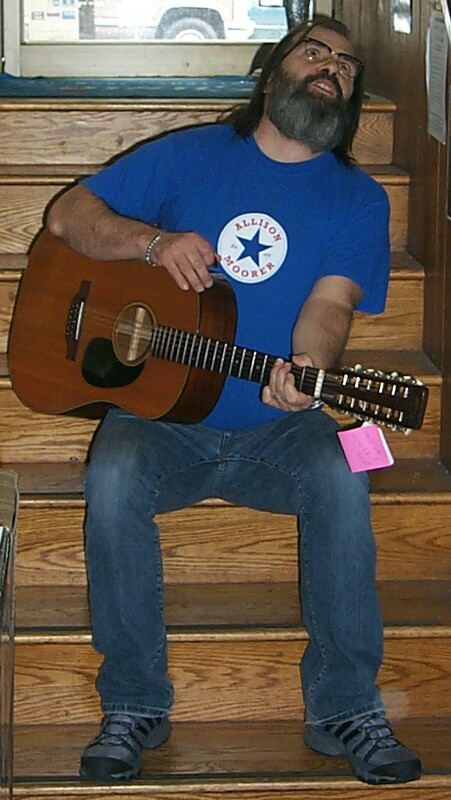 Guitar League of Ithaca: http://www.guitarleague.com/ithacaleague.html Join with friends and learn. 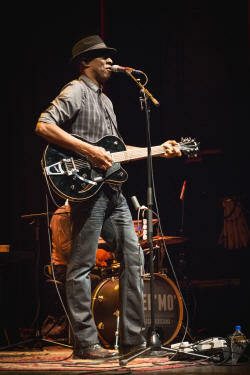 Jerome Harris: http://www.jeromeharris.com/ Jazz guitar and bass performer and educator. Hip Shot Products: www.HipshotProducts.com Specialty guitar accessories and hardware products. David Holt: www.davidholt.com Multi-instrumental performer and storey teller extraordinaire. Kinloch Nelson: http://www.kinlochnelson.com/ fingerstyle guitarist extrordinaire. Ithaca Stringed Instruments: www.ithacastring.com Custom, hand built instruments and repair. John Jorgenson: http://johnjorgenson.com/ Extraordinary guitarist in any style. Dan Levenson: www.folknet.org/dan/meetbnjo.htm Banjo and Fiddle instructor, author and performer. Stacy Philips: www.stacyphillips.com Dobro and Fiddle master, recording artist and author. Pickin' In The Pasture: http://www.pickininthepasture.com/index.cfm World class bluegrass festival in our backyard. Every August in Lodi, New York. Duke Robillard: http://www.dukerobillard.com/ W. C. Handy blues guitarist of the year, again! Doug Robinson: www.Watershed-Arts.com Multi-instrumental performer. Martin Simpson: http://www.martinsimpson.com/ Finger style and blues guitarist extrordinaire. John Stowell: http://johnstowell.com Jazz guitar performer and educator. WICB 91.7 FM: http://www.ithaca.edu/radio/wicb/ The station for innovation. Ithaca Guitar Works is a program sponsor for "Hobo's Lullaby" and "Blues Progressions". WVBR 93.5 FM: http://www.wvbr.com/ Ithaca's real rock radio also at 105.5 FM. Ithaca Guitar Works is a program sponsor for "Bound for Glory" and "Crossroads". Kathy Ziegler: www.kathyziegler.com Singer/Songwriter, performer and multi-instrumentalist.